Castles induce the perfect nostalgia: of sweet childhood memories spent flipping through storybooks and seeing princes and princesses, of verdant estates and imposing architecture sequestered from the world with moats and drawbridges. Even though the predominant reign of monarchies in North America is fairly nonexistent, this doesn’t mean these charming fortresses do not exist! Matter of fact, there are plenty of places around the country that are certified castles, and are even open to hosting your dream events! And who knows? If you fall in love, some of these castles are for sale! Located in Asheville, North Carolina, this castle is on the U.S. National Register of Historic Places and the U.S. National Historic Landmark District. The main residence is a Châteauesque-style mansion constructed by George Washington Vanderbilt II between 1889 and 1895 and is the largest privately owned house in the country! Shrouded in an eggshell white exterior and embellished with vibrant blue trimmings, this estate exudes sheer elegance—with a twist. On the interior, the castle spans three floors and acts as a visually stunning time capsule, touting displays of vintage clothing, accessories, art, furniture and other pieces that illustrate the lives of the Vanderbilt family, their guests and employees. Among other features within castle walls include stunning, exclusive art by Pierre-Auguste Renoir and John Singer Sargent, a library with an impressive collection of 10,000 books, a banquet hall with a 70-foot ceiling, 65 fireplaces, an indoor pool, and even a bowling alley! Want to host an event here, now that you’ve absolutely fallen in love with this historic estate? Biltmore Castle has a plethora of different packages, including deals for weddings, special occasions, and group events. Fonthill Castle was the home of American archaeologist and tile maker Henry Chapman Mercer, and is located in Doylestown, PA. Built between 1908 and 1912, it was one of the first examples of poured-in-place concrete, a type of building technique where concrete is poured into forms where it will set, be finished, and remain almost permanently. The castle offers a whopping 44 rooms, over 200 windows, 18 fireplaces, 10 bathrooms and one powder room. The exterior of Fonthill is modest in architecture, with quaint light gray bricks and copper red trimming. However, the interior tells another story. Although the bright pastel colors that once adorned the inner castle walls has since faded, this doesn’t dim the stunning aesthetic. The castle contains a large amount of built-in furniture, embellished with decorative tiles that Mercer hand-crafted at the height of the Arts and Crafts movement. Additionally, the castle is filled with an extensive collection of ceramics embedded in the concrete structure of the house, as well as other exclusive artifacts from his world travels, including cuneiform tablets discovered in Mesopotamia dating back to over 2300 BCE. The castle was listed on the National Register of Historic Places in 1972, and was later placed in a National Historic Landmark District. Fonthill offers castle rentals year-round, as well as indoor and outdoor options. Also known as the Otto Kahn Estate, or the ‘Gold Coast Mansion’, this castle is located on the North Shore of Long Island, in the West Hills section of Huntington, NY. It was the country home of investment financier and philanthropist Otto Hermann Kahn and his family. 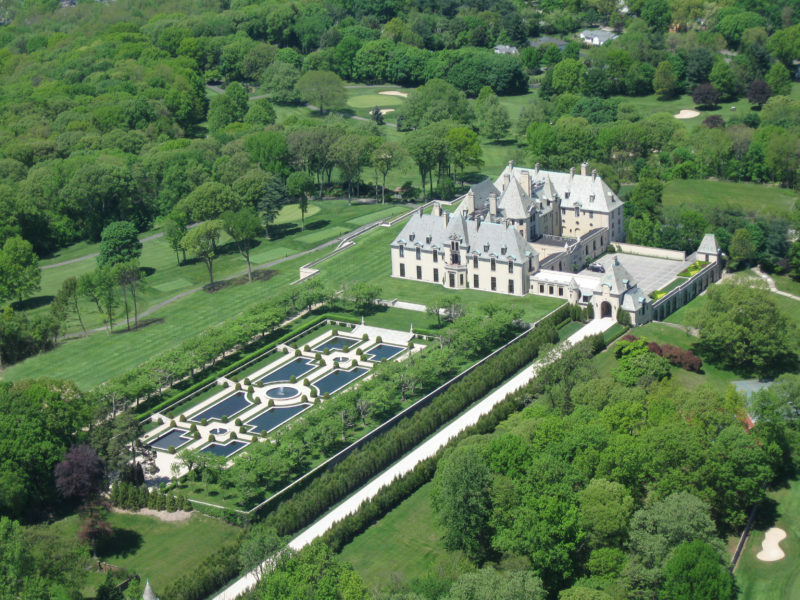 Oheka resides majestically on the highest point of Long Island, exuding the elegance and refinement of a chateau in France, coupled with a rich American history. Nowadays, the castle is recognized as one of the most prestigious wedding and event venues in the World (Kevin Jonas and Danielle Deleasa got married here! ), and is a member of Historic Hotels of America®, a program that celebrates the finest hotels across America. The castle boasts 32 luxurious guest rooms and suites, a stately library, in-room massages, a garden designed by prominent landscape designers the Olmsted Brothers, and more! Want to host an event here? Oheka offers plenty of packages for galas, weddings, special anniversaries, bar/bat mitzvahs, sweet sixteens, and other special occasion events! To book an appointment with a sales representative to tour the castle and gardens, they have a request form on their site. This castle was designed by architect Richard Morris Hunt, the first American to study at the renowned École des Beaux-Arts in Paris and was no stranger to creating masterpieces, and is located on Bellevue Avenue in Newport, Rhode Island. Construction started in 1891 and ended in 1894, and was only intended to be used six to eight weeks of the year. Interestingly enough, the castle contains an amalgamation of architectural influences, such as French Renaissance and Gothic decor, with further borrowings from German, English and Italian design. In the Gilded Age, the castle became notorious for its extensive stables and carriage areas, which have been added into the main structure. Similar to the Biltmore Castle, the exterior of the fortress is shrouded in pure, ivory white, as well as teal and brick-colored trimmings. The owner of the castle, Oliver Belmont, fell head-over-heels in love with his recently divorced neighbor, Alva Vanderbilt, and after their swift marriage, she began to add her own flair and personality to the mansion. She wanted the castle, also known as her “summer cottage”, to be a venue for elegant soirees and elite social gatherings, so she touched up the estate with exquisite Renaissance details. The castle is now underneath new ownership, and is run by Carolyn Rafaelian, founder of jeweller and retailer, Alex and Ani. Although it is one of the younger castles, established in 1913, this fortress certainly doesn’t lack any history. Interestingly enough, the castle was built by the Knights of Pythias, a fraternal organization and secret society that was founded in Washington, D.C., on February 19th, 1864. German and Italian prisoners-of-war were assigned here during World War II for medical treatment and as laborers, and the laundry room in this castle is still owned by the U.S. Army! The building was listed on the U.S. National Register of Historic Places on October 7, 2009. Pythian Castle is known as Springfield’s most enchanting event venue, and hosts various public events like history tours, ghost tours, murder mysteries, and holiday events. If you’re interested in having a wedding or private event here, the castle has a section on their website dedicated to private rentals. Where did you get married? Have you visited castles before in the US?